Existing approaches for opinion mining mainly focus on reviews from Amazon, domain-specific review websites or social media. Little efforts have been spent on fine-grained analysis of opinions in review texts from mobile smart phone applications. 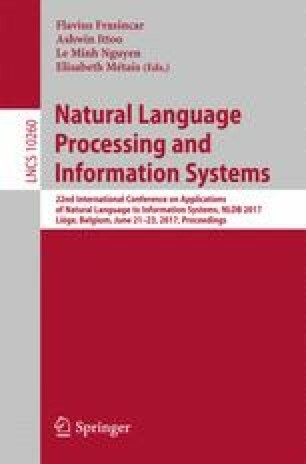 In this paper, we propose an aspect and subjective phrase extraction model for German reviews from the Google Play store. We analyze the impact of different features, including domain-specific word embeddings. Our best model configuration shows a performance of 0.63 \(F_1\) for aspects and 0.62 \(F_1\) for subjective phrases. Further, we perform cross-domain experiments: A model trained on Amazon reviews and tested on app reviews achieves lower performance (drop by 27% points for aspects and 15% points for subjective phrases). The results indicate that there are strong differences in the way personal opinions on product aspects are expressed in the particular domains. We thank Christian Scheible, Peter Adolphs and Steffen Kemmerer for their valuable feedback and fruitful discussions.